Most of us living on Kauai are familiar with the Hawaiian words "mauka" and makai". Because we live on a circular island, we often use these words to give directions relative to the road. "Mauka" means "inland", and "Makai" means "seaward". 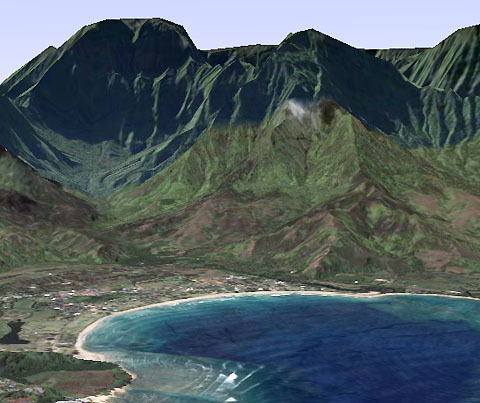 Unlike Oahu and Maui, Kauai does not have a wide central valley crossing the island. Instead we have have a dome of mountains reaching five-thousand feet and shaped to catch the clouds. And unlike Oahu and Maui, the vast part of the inland area is uninhabited, and set aside as conservation land. In that way we may have been blessed. The quality of our lives on Kauai is deeply affected by what we see when looking mauka and makai: Inland are majestic mountains, seaward the Pacific Ocean. On Kauai people live between these two realms. One of the things that makes living here worthwhile is keeping what is mauka and makai pristine. Back in September 2004, the Kauai Heritage Foundation sponsored a talk on reforestation on Kauai. My wife and I attended thinking it might be a talk by a botanist or conservationist. The presentation was titled "Pohala I Ka Nahele" and was presented by Kehualani Kekua of the Halua Palahiwa O Kaipuwai. "Pohala I Ka Nahele" translates as "Revival of the Wilderness". Kehualani Kekua spoke of forest renewal, but also led us on a spiritual journey that gave me a new perspective from which to view Kauai. To begin with she described a cross section of the island from mountain peak to shore and characterized inland sections of the landscape from a Hawaiian point of view. She characterized the less precipitous island regions as "Wao" (meaning inland area with forest). at the top was Wao Akua. Below was Wao Lani and at the bottom was Wao Kanaka. Wao Akua (God's Region) is the high altitude forest in the mist where the forest gods lived. Hawaiians very infrequently went there – never without reason – never for recreation – only for special purposes with permission of the gods. Wao Lani (Chief's Region) is upper forest and a place of heavenly spirits. It was a depository of shared natural resources and was a necessity in ancient times. Koa for canoes, herbs for medicinals, and sacred items for adornment grew in Wao Lani. It was an uninhabited area without agriculture, but some forest management provided by alii and kahuna. Wao Kanaka (People's Region) is the lower forested areas where most Hawaiians lived. The Wao Kanaka was where agriculture was practiced and man had the most influence on the land. It was the area where people were meant to be and had the most freedom. Because of the natural distribution of water, this was mostly in the valleys. The greatest interference with this ancient system on Kauai has been the introduction the sugarcane industry. To begin with, it required diverting the majority of the water that fed the fertile lowland valleys to the vast dryer uplands that were clear cut for the plantations. The underlying philosophy of the plantations owners was that they could take all the water they needed from the valleys and leave in the river only what they could not use. The first casualty of water diversion was the destruction of Hawaiian valley agriculture and community. Hawaiians could no longer practice their time tested way of life. The second casualty of the water diversion was the destruction of the lowland forest and soon after its topsoil. Instead of supporting nitrogen fixing trees like opuma, haole koa and kiawe, the hillsides were burned to the ground and left raw dirt every two years. The damaged soil blew away on the wind and ran off into the ocean to destroying the reefs. There is certainly a shared sense that the highland forest of Kauai needs conservation and there are some mechanisms in place to assure that. However the sentiment that protects the highlands is not applied to the island as a whole. It is not widely appreciated how weak, thin and fragile the topsoil of the Garden Island is. What can we do to reverse the fate of the land? • The current plan for "saving" Kauai's rural character is to grow ethanol from cane. As Alice Friedmann writes in www.culturechange.org "Ethanol is an agribusiness get-rich-quick scheme that will bankrupt our topsoil." and as an unnamed Pennsylvania farmer said "It looks like we're going to burn up the last remaining six inches of our topsoil in our gas-tanks." • What we really need is an island wide plan of reforestation of our lowlands and mountain foothills. With some diverted water, this will have commercial value and provide a measure conservation as well. • We should be supporting koa and sandalwood forests where ever we can. Hawaii is one of 7 places in the world sandalwood is grown; Chinese called Hawaii "the Sandalwood Islands"; Sandalwood was known to have been more costly than any other wood in the world, and sold by the pound for use in medicine, incense & perfume. You may not have noticed, but the world ocean is dying. Commercial over fishing is part of the problem. For example, bluefin tuna is one of the most economically valuable and exploited fish in the sea. A single bluefin can bring as much as $20,000 at U.S. docks. The number of adult bluefins in the Western Atlantic is estimated to have dropped almost 90 percent since 1970. And The Seattle Times reported this week that "Scientists taking a new look at old videotapes of the muddy seafloors off southern Oregon found that places showing tracks from the nets of fishing trawlers had fewer numbers and kinds of fish than areas that were undisturbed." Global warming is another factor. The UK's Independent reported that here in the pacific "A catastrophic collapse in sea and bird life numbers along America's Northwest Pacific seaboard is raising fears that global warming is beginning to irreparably damage the health of the oceans." Even Fox News is reporting "Marine biologists are seeing mysterious and disturbing things along the Pacific Coast this year: higher water temperatures, plummeting catches of fish, lots of dead birds on the beaches, and perhaps most worrisome, very little plankton, the tiny organisms that are a vital link in the ocean food chain. Coral reef are the nurseries of the sea. The Hawaiian islands are the closest reef to several million square miles of Pacific Ocean. We cannot afford to screw it up. Coral loss throughout the world is a crisis for the many ocean species that depend on reefs for reproduction and food. Overfishing by surfcasting and noncommercial boats are a factor too. Since 911 the PMRF has closed about seven miles of beach public access and denied approach to the shore by civilian boats. Many Kauai residents complained about these restrictions. One day I was making small talk with a westside friend about how terrible this was. My friend is a Japanese-Hawaiian born on Kauai. He is an avid net thrower, opii picker, and surfcaster. He thought the Navy restrictions were just fine. He told me that since the seven miles was off limits that fish populations have been rising and he sees signs that population pressure is pushing fish into areas where fishing is permitted. For fish and fisherman a win-win situation. What can we do to reverse the fate of the oceans? • Strictly enforce the legal protection of marine life in our islands, especially the Northwest Hawaiian Island Marine National Monument. • Make fishing temporarily kapu (taboo) in designated shoreline areas based on reproductive rates and ecological health. Regional Saltwater Fisheries Councils could work like Watershed Conservation Councils to assure local health and productivity. • Restore and build new fishponds like the old Hawaiians did. Let's start with a demonstration project at the biggest on Kauai, the Menehune (Alekoko) Fishpond on the Haleia Stream. • Encourage modern aquaculture efforts that are eco-friendly and compliment other food producing activities related to water management, like taro. This would include keeping adequate fresh water in our rivers so support their natural marine life. • Do not employ agricultural techniques (like growing sugarcane) that ultimately result in soil run-off into the oceans. In general slow the movement of water off the island. • Restrict access to reefs by uneducated or unscrupulous. We should not see tourists standing on a coral head so that they can adjust their snorkel masks. There is a natural resentment of authoritarian controls is our lives. Unfortunately, our freedom is in many ways inversely proportional to our numbers. In other words, the fewer the people, the greater the freedom they have. People are weighing heavily on Kauai, and as the Hawaiians found out, when there are too many of us the kapuna had to set up a kapu system to keep things fair and balanced. Achieving, and not exceeding, a comfortable population for Kauai is as important an element determining our well-being as it is for the world.